I believe sometimes all of us suffer from the limitations of playing with Oracle’s SH, SCOTT, etc. schemas to generate a sufficiently large playground for our tests. In this post you will find how to create your own TPC-H playground database on Linux. Next thing you should do is to cp makefile.suite file in tpch directory and change some parameters in copied file. Now you are ready to create your playground database. For those of you who are not familiar with TPC-H model, refer to below Relational Model to have an idea of what it looks like. Starting to load stage 1 of 8 for customers table…done. Starting to load stage 1 of 8 for orders/lineitem tables…done. Starting to load stage 1 of 8 for part/partsupplier tables…done. Generating data for nation tabledone. Generating data for region tabledone. Starting to load stage 2 of 8 for customers table…done. Starting to load stage 2 of 8 for orders/lineitem tables…done. Starting to load stage 2 of 8 for part/partsupplier tables…done. Starting to load stage 8 of 8 for customers table…done. Starting to load stage 8 of 8 for orders/lineitem tables…done. Starting to load stage 8 of 8 for part/partsupplier tables…done. When you are done with all 8 executions you will have *tbl* files in your current working directory. Those are pipe separated files which you will be loading into your database. –s 4 specifies that we are using a scale factor of 4 meaning that we are generating approximately 4GB of benchmark data. –S 1 instructs dbgen to generate first of 8 chunks. –C 8 is the total number of files for each large dataset (excluding nation and region tables). –v is setting the verbosity for dbgen. In total you will see that all *tbl* files will be approximately 4 GB in size. A good idea is to compress all those files with gzip so that they will consume minimum disk space and optimize read I/O in case of CPU power abundance. As you see above I have achieved more than 1:3 compression ratio for all external files on the average. 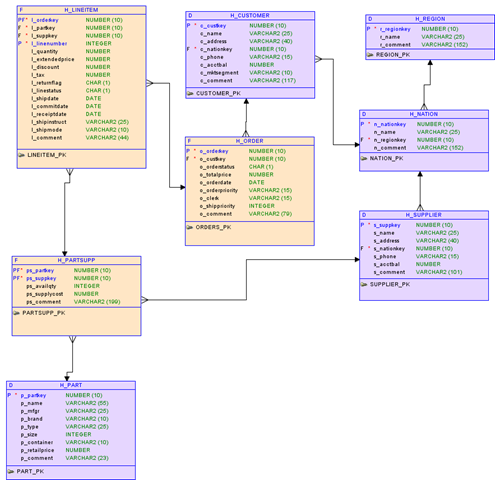 Follow the guide lines for creating permanent and auxiliary database objects. Create a TPCH user and give necessary grant to it. Create an Oracle DIRECTORY (TPCH_DIR) object to point the directory that contains your *.tbl*.gz files. See that for the sake of simplicity I have used VARCHAR2 column for DATE columns those will be casted to DATE type during load operation. Use inline gzip decompression with PREPROCESSOR option. Create your external tables with proper parallelism to read external files concurrently. Remember to use APPEND hint for INSERT … SELECT statements. Don’t create PK&FK constraints so that you can load in parallel. Load your data from auxiliary External tables to your permanent heap tables. Create all necessary constraints on your permanent tables. Gather a schema statistics to guide CBO correctly. Next step is to create your persistent objects (heap tables) without PK and FK constraints on them. Now you are done you. You can either execute infamous TPC-H queries (you can find in TPC-H documentation) or your own test cases.